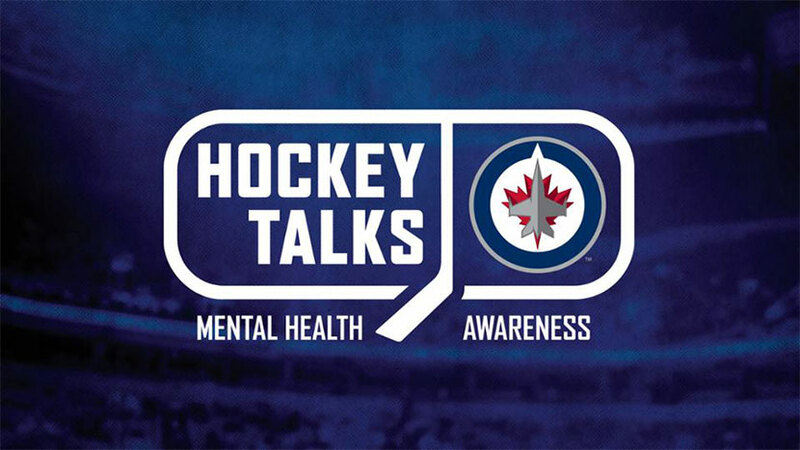 The Winnipeg Jets are proud to host their fifth annual #HockeyTalks day on February 28, 2017, when they host the Minnesota Wild. #HockeyTalks is a national public awareness campaign for Canadian NHL teams designed to encourage conversations about mental health. The campaign showcases mental health resources and provides information from leading experts, and alleviates some of the misconceptions and stigma associated with mental illness. Additionally, on Feb. 28, fans can show their support by posting their pictures via social media with the hashtag #HockeyTalks. Jets fans will also receive a complimentary Project 11 bracelet, plus have the opportunity to purchase special retail items at Jets Gear stores. Jets players will also have special #HockeyTalks logos on their helmets during the month of February. Tuesday, Feb. 7 – Minnesota Wild vs. Winnipeg Jets at 7 p.m.
Friday, Feb. 10 – Chicago Blackhawks vs. Winnipeg Jets at 7 p.m.
Saturday, Feb. 11- Tampa Bay Lighting vs. Winnipeg Jets at 7 p.m.
Tuesday, Feb.14 – Dallas Starts vs. Winnipeg Jets at 7 p.m.
Tuesday, Feb. 28 – Minnesota Wild vs. Winnipeg Jets at 7 p.m.
To learn more how the True North Youth Foundation works to provide mental health programs and resources for youth, please visit www.projecteleven.ca. According to mental health experts, on average one in five Canadians will experience a mental health problem or illness in their lifetimes; thereby affecting indirectly many more Canadians through a family member, friend or colleague. Stigma or discrimination attached to mental illnesses presents a serious barrier, not only to diagnosis and treatment, but also to acceptance in the community. Approximately 70 percent of mental health problems and illnesses have their onset during childhood or adolescence. Identifying the signs early and getting connected to tools and support is the most important way to prevent problems from becoming worse. Mental health problems and illnesses can be treated effectively. These statistics were compelled from information available through the following websites: Mental Health Commission of Canada, Canadian Mental Health Association, and the Centre for Addiction and Mental Health.